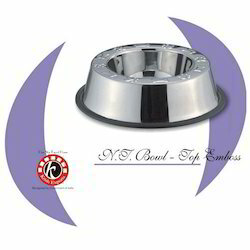 We are offering Top Emboss Non-Tip Pet Bowls to our clients. Offering its clients a wide range of petware products, Jayna Steel India has built its name as a leading manufacturer and exporter of petware products like Coup Cup With Wire Handle, etc. The company is known for its vast years of industry knowledge. On account of our advanced production setup, we are able to offer Stainless Steel Pet Utensils. We are known for providing the best pet dinner set which are specially designed, keeping every minute thing in mind. These pet dinner set and racks are very spacious and promise to provide a long term usage to the end users. These pet dinner set & racks are available in sizes as per clients requirement and that too at very affordable prices. 8 Oz. : These beautiful and innovative top embossed Non Tip Pet stainless steel Bowls With Anti-skid Rings are a must for all pet lovers. The deep cavity of the bowls further ensures right amount of nutritious food is delivered to satisfy the hunger pangs of the pets. Our range of petware products are made from superior quality stainless steel ensuring that they are highly durable. Hygienic, odour free, chew proof, easy to clean and dishwasher safe, each piece is hand polished by the finest artisans. 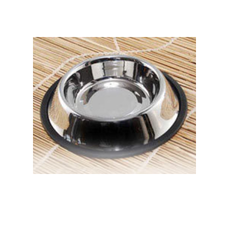 We offers Regular Embossed Pet Bowls to our clients. Offering one of the unique designs at hard to beat prices. Being a customer focused organization, we are engaged in offering a wide assortment of Mountain Anti Skid Pet Bowl. These products are manufactured and developed using high grade raw material, used to feed pets. In addition to this, our clients can avail this range from us in various sizes, designs and custom-made forms. For catering the variegated needs of our clients, we are deeply engrossed in offering a qualitative array of Adjustable Double Diner. We manufacturean exclusive range of stainless steel petware that is corrosion resistant.These are ideal for serving food to the beloved pet. This product is availablein various sizes and can be tailor-made according to client specifications.